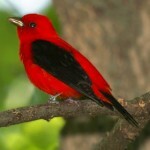 Description: Breeding male is bright red overall with black wings and tail, and yellow bill; winter plumage is yellow-green overall with black wings and tail. Female has uniformly olive head, back,and rump; slightly paler below; whitish wing linings; and yellow undertail coverts. 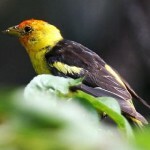 Habitat: Mostly restricted to mature hardwood forests in river valleys and hill slopes. Occasionally found in city parks and mature orchards. 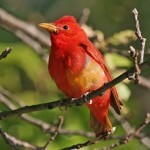 Where in Nebraska: Uncommon spring and fall migrant and summer resident in eastern Nebraska, becoming rarer westwardly. 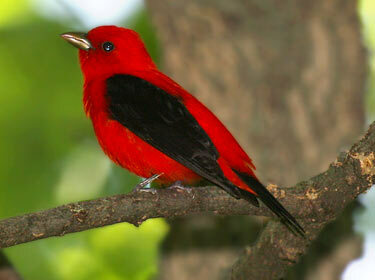 Field Notes: Scarlet Tanagers spend their winters in South America. Fun Facts: The female Scarlet Tanager sings a song similar to the males to answer his and while she is gathering nest materials. Females tend to forage higher in trees than males and also they do more “hawking” for insects.